Few elements make a Thanksgiving Day table as special as colorful custom napkin rings. This ring is easy to make because the foundation is Polymer Clay. Just bake it in the oven before the Turkey! This clay is blended, cut, textured, and imprinted with the message "Give Thanks". The leaf base is Rose Gold, a rich color clay which is lightly flecked with dots of glitter. When mixed with white, it becomes shades of peach, mixed with ecru, it becomes shades of pumpkin, and left on its own, it becomes a delicious contrast. The best part is you get to choose where to position your stencil on the clay to take advantage of the colors and determine where they will appear in the finished project. Create the same ring for all your guests or vary them by replacing the Rose Gold clay with Olive Green, Alizarin Crimson, Orange, Copper or other Fall Colors. step 1 - CK - Download and print out the leaf template onto card stock. Set aside. 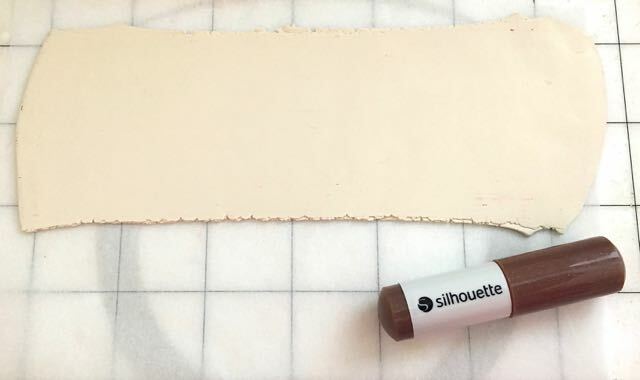 step 2 - Create the soft beige color for the rectangle by mixing White with a small amount of Ecru (about .24 Ecru to .75 white). Roll the clay on the #3 setting of the conditioning machine. Step 3 - SC Cutting - Place the clay on the shiny side of Freezer Paper and set it on the cutting mat. Use the grid to match the clay on the mat to the image in the design window. Remove the cap from the deep cut blade and set it to its maximum length. step 4 - SC - Drop the blade into the red position of the blade holder. Drop the brown sketch pen in the blue position. Choose Thick Fabric, and 4 platforms in the red settings cut window. Select only the rectangle to cut. Cut the clay but do not remove it from the mat. step 5 - SC - Lettering - Change to two platforms. Choose the following blue settings in the cut window: Sketch pen, Speed 10, Thickness 1 and Double Cut. Create a new "Sketch On Clay" menu item with these settings to avoid having to key them in again in the future. Step 6 - SC - Sketch the lettering onto the clay. Step 7 - CK - Cut the clay to measure 5.50" x 2". Use the Silhouette Sketch pen to write the words "Give Thanks" with a light touch. Avoid digging the tip into the clay. The lettering should be placed about 2" in from the left edge, .25" from the top edge and no deeper than .75" tall. Step 8 - Press a one-inch texture onto the bottom length of the band. I used one side of a Sizzix embossing folder. Brush baby powder onto the folder to prevent it from sticking to the clay before applying it. Step 9 - Tear pieces of conditioned clay in three colors - Rose Gold, Ecru and White. Roughly clump them together alternating colors and adding until the group is as large as the leaf stencil. Step 10 - Roll across the clay with an acrylic roller to connect the pieces then run it through the conditioning machine on the #2 setting. 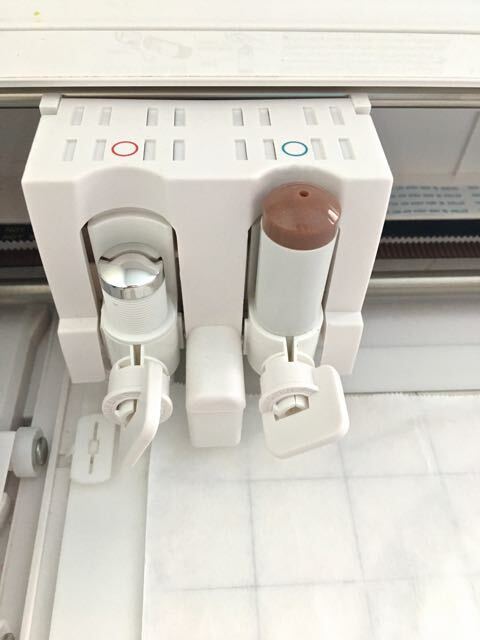 Fold the clay in half vertically and put it through the machine again. Keep repeating this until you like the color blend. Step 11 - SC - Cut the leaf on the Curio following the same directions as in step 4. CK - Place the leaf stencil on the clay. Follow the outline with a craft knife. Step 12 - Using a sculpting tool, make impressions along the vein lines. Step 13 - Press the leaf to the right of the lettering on the clay band. Step 14 - Cut a 3.50" tube from a toilet paper roll. Cut a strip of parchment paper 5.50" wide and 8" long. 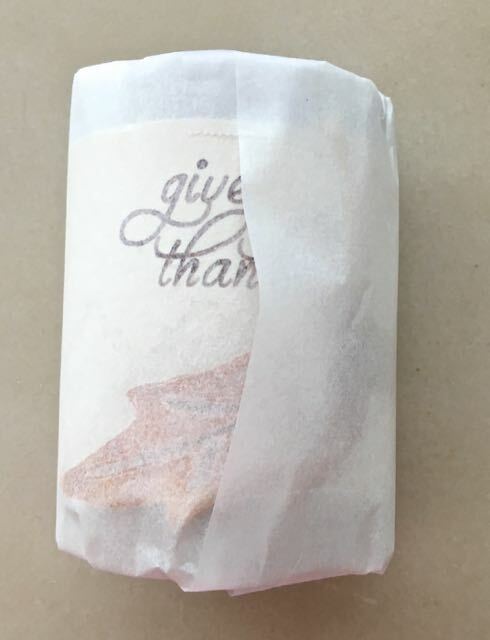 Wrap the paper around the roll and tuck in the excess to hold it in place. Step 15 - Cut another piece of parchment the same size. Place the clay face down on it. Do not slide the clay on the paper or the ink may smudge. Step 16 - Set the wrapped roll in the middle of the clay. Step 17 - Bring both clay ends to the center back. Join the ends and smooth over the seam. Step 18 - Wrap the parchment over the clay tucking in the excess on both open sides of the roll to hold it together. Step 19 - Bake the clay standing in a 275 degree oven for 30 minutes. When cool, spray it with a glaze. The 5.50" measurement for the clay in this project is based on the measurement around a cardboard toilet paper roll I used. Not all toilet paper rolls may be identical so be sure 5.50" will reach around yours and adjust the measurement if necessary. This will be important when it's time to wrap the clay around the roll. Also be aware that most toilet paper rolls and paper towel rolls are not the same size. The sketch pen lettering will not smudge once baked but it will run if some types of glazes are applied with a brush. To protect the ink, use spray-on Glosscote.